Serve this aromatic Malaysian specialty with jasmine or basmati rice. You can also enjoy it with bread, using it as a filling for pita, naan, tortillas, or any other flatbread. Rendang is typically very thick, but if you prefer a saucier dish, you can add a little water after adding the toasted coconut at the end. 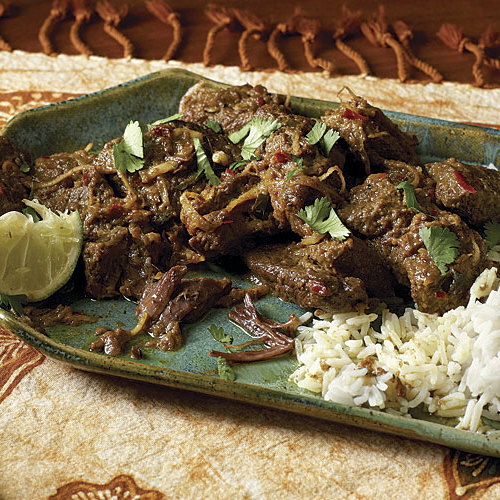 View a slideshow to learn more about the ingredients that make this rendang incredibly aromatic. If using dried chiles, steep them in hot water until pliable, 5 to 8 minutes; then slit and seed them (use gloves). Put the chiles, shallots, garlic, ginger, galangal (if using), and 1/4 cup water in a food processor and process to a coarse purée, about 3 minutes (if using whole dried chiles, you’ll still see little pieces of the skins). In a small bowl, combine the cloves, cardamom pods, star anise, and cinnamon pieces. In a second small bowl, combine the coriander, cumin, fennel, turmeric, and pepper. Heat 2 Tbs. of the oil in a 12-inch skillet or wok over medium-low heat until shimmering hot. Add the whole spice blend and cook, stirring constantly, until the cinnamon sticks unfold (the cardamom may also crack open), 1 to 2 minutes; don’t let the spices burn. Add another 2 Tbs. of the oil and the ground spice blend and cook, stirring constantly, until the mixture sizzles and becomes fragrant, 30 to 60 seconds more (if the spices stick to the pan, add a little more oil to prevent burning). Add the remaining 1/2 cup oil and the flavor base and cook, stirring, until the purée is an intense reddish-brown, about 10 minutes. Raise the heat to medium, add the beef and cook, stirring, to coat it with the spices, about 2 minutes. Add the coconut milk, tamarind concentrate, lime leaves, and lemongrass and cook, stirring constantly, until the mixture comes to a boil, about 5 minutes. Reduce the heat to low, add the sugar and salt, and simmer, stirring occasionally for the first hour and then more frequently as the stew thickens, until the liquid is very thick and oil appears on its surface, about 1-3/4 hours. The meat will not be fork-tender at this point. Meanwhile, squeeze any excess liquid from the coconut with your hands. In a 10-inch skillet, toast the coconut over low heat, stirring constantly, until golden-brown, about 10 minutes. Transfer to a small bowl. Stir the toasted coconut into the stew and then continue stirring until it’s incorporated and much of the liquid is gone, about 15 minutes. Add 1 cup water if you prefer a saucy consistency. Continue to cook, stirring frequently, until the meat is fork-tender, 20 to 30 minutes more (the oil will start frothing after 15 to 20 minutes). Remove the lemongrass, cinnamon pieces, star anise, and as many cardamom pods and cloves as you can find. Transfer the meat to a serving platter and garnish with the cilantro and lime wedges (if using). Beef rendang will keep for up to 5 days in the refrigerator, but expect it to become drier and more intense as it sits. I have made this recipe many times and it is a favourite in my house for both family and friends....the flavours are amazing! Ended up having to make my own tamarind paste as all I could find was the tamarind pods but it was worth the work! Best magazine ever!! Very disappointed with this recipe. Too much oil for one thing. The choice of meat was like shoe leather even after cooking for the recommended time and so greasy.. The tamarind paste was black which darkened the whole dish and made it looked burnt. The tamarind shown in the article looks like a juice that is light colored and not a paste. The entire dish does not LOOK like the photo at all. I am glad I was not serving this dish to company. 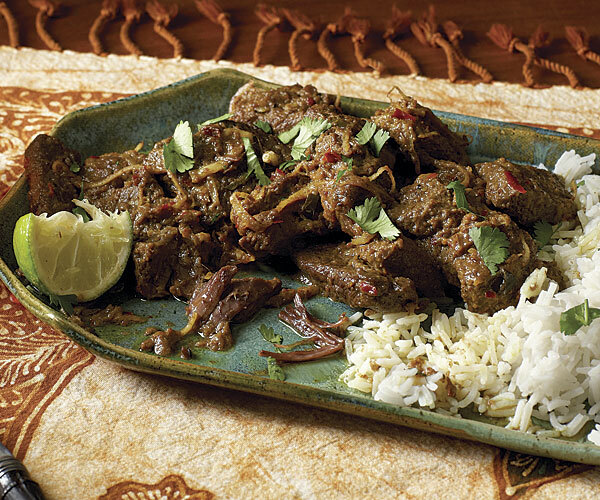 I will stick with my recipe for Beef Rendang from All About Braising by Molly Stevens. Absolutely delicious. Restaurant quality. I'm sorry I halved the recipe. Next time I will make the whole amount and freeze the extra. The most time consuming part is preparing the spice mixtures and paste so might as well do it only once. Do give this a try.